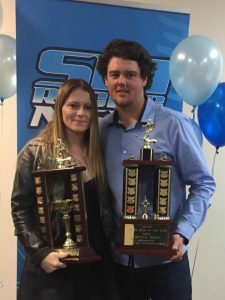 A big congratulations to Shantelle King and Cameron Osborne for both winning the NSW skier of the year awards for a second consecutive year. Best wishes and our support to these guys as they go to represent Australia at the world skiing championships and the prestigious Catalina race next month. Both of these guys are consistent boot campers and do personal training with us and we are proud to have helped them maintain a strong foundation of strength, fitness and mobility to help them in their pursuits. very challenging sport…all-round body fitness & core strength are crucial. Congratulations to the Champs… and of course their fitness trainer.